The Swan Levine House plays significantly into the history of Nevada County. It was built in 1867 by John and Catherine Fahey, who were partners in the Alison Ranch Mine. They sold it to William Campbell, a local merchant who made his fortune selling mining equipment. 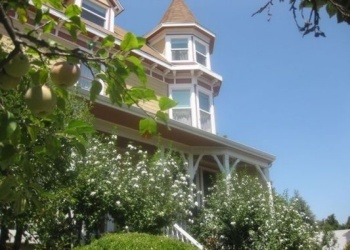 Campbell remodeled the house in 1895 after a fire to its present Queen Anne style. After his death, the house was acquired by brothers, Doctors Carl and John Jones, they opened it as a hospital and named it after their father, Dr. W.C. Jones. Howard Levine and Margaret Warner Swan purchased the the house after the hospital closed; renovating it as a guest house with a focus on their interest in visual arts and printmaking. The fine art of Printmaking is illustrated by their extensive collection of art throughout the house. The inn keepers, Howard and Margaret (Peggy) have degrees in Fine Art Printmaking. Howard teaches drawing and printmaking locally for Sierra College, and is the Executive Director of the Grass Valley Downtown Association. Both are active in the community and serve on local arts boards. 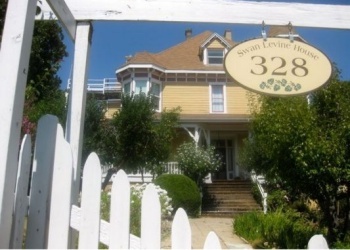 The Swan Levine House has four guest rooms; all have private baths with claw foot tub shower combinations. The Hospital�s Room 1 was the original master bedroom in the house. 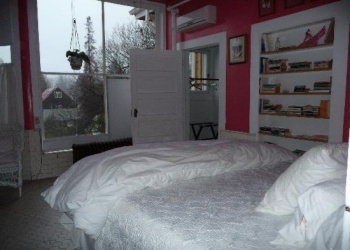 It is now a suite with a large bedroom with queen bed, separate sitting room with a fireplace. The Surgery has a king-size bed that can be made-up as two twins, octagonal white floor tiles, lots of windows and the bathroom retains the antique scrub-up sinks. The Green Room is also a two-room suite, with a queen canopy bed. The Apartment is a 1930�s addition by the hospital. It has its own exterior and interior entrance, deck, kitchenette, queen and two single beds. Its d�cor is appropriate to its place in history. The Printmaking Studio is also available for artists and for those just interested in the medium. Swan Levine House is a short walk from downtown Grass Valley, which has unique retail shops, cultural events, restaurants, and the historic art deco Del Oro movie theatre.